Pennyroyal Swamp Mallow is an undershrub, erect, up to 1.5 m tall; stems purple with scattered minute simple and star-shaped hairs. Leaves are 1.2-3.5 x 1.4-3 cm, ovate-heart-shaped, entire or 3-angled, pointed at tip, irregularly toothed, 7-nerved at base, star-shaped-hairy on both surfaces; leaf-stalks 0.8 - 2.5 cm, star-shaped-hairy; stipules 1.5 - 6 mm long, linear, hairy. 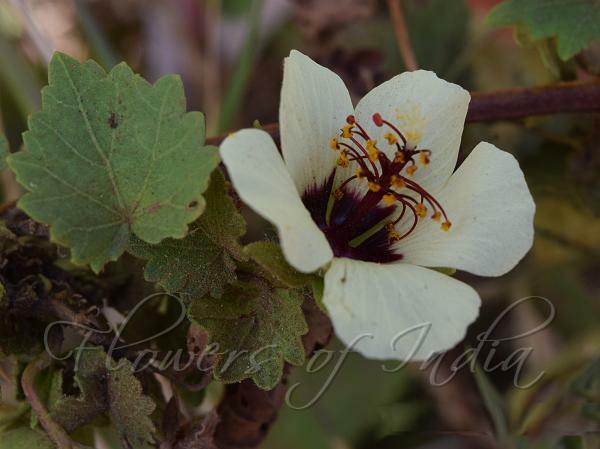 Flowers are borne singly in leaf-axils; flower-stalks 1.5-4 cm, jointed towards tip, star-shaped-hairy. Epicalyx segments 5, fused at base, spreading, 16-18 x 3-4 mm, lanceshaped, star-shaped-hairy outside, sparsely simple and rarely star-shaped-hairy inside, margins with star-shaped and simple hairs. Calyx is 6-10 mm long, 5-lobed, sepals fused at base, 6-10 x 4-5 mm, deltoid-ovoid, pointed, stellato hairs intermingled with gland-tipped hairs on outside, sparsely velvet-hairy inside. Flowers yellow with dark purple centre, 1-2 cm across; petals 12-15 x 7-10 mm, rhomboid-obovate, more or less rounded at tip, fringed with hairs at base, scattered with star-shaped hairs and a few gland-tipped hairs outside, margins sparsely with few simple hairs. Staminal column about 1 cm long, antheriferous mainly towards tip, 5-toothed at tip. Ovary about 1 x 1.5 mm, obovate; style to the branching about 10 mm long; stigmas 10, capitate, densely velvet-hairy. 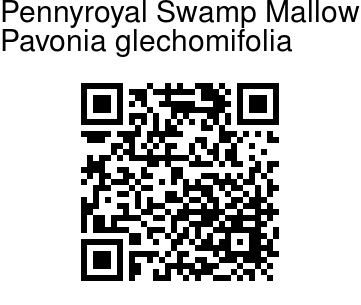 Pennyroyal Swamp Mallow is found in Ethiopia, India and Pakistan. Identification credit: S. Kasim Photographed in Tirupur Dist. Tamilnadu.